Lydia Salah sends me photos but asks me not to publish them, anywhere. It’s a family history. Here she is, with short, blond hair, early-1990s style, light skin, glossy pink lipstick, in a white muslin dress. He’s next to her – brown-skinned, black forelock and almond eyes, wearing a floral-patterned vest and a white shirt. She looks focused and a bit upright; he’s smiling lightly, proudly. They’re both young and beautiful. The pictures tell the story of their love. 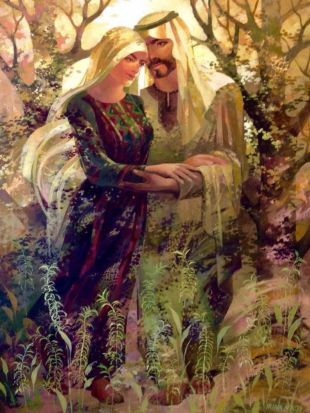 In this one she’s sitting on his lap and hugging him, in another they’re standing and smiling, a spring sun lighting up their faces, against a background of bare trees and a structure that looks like a Russian Orthodox monastery. Here they are in the snow, here’s a shot of them hugging their firstborn child, Lydia’s head covered with a checkered keffiyeh. In this one she’s standing with the carriage and the baby next to a typical Soviet housing block, and here she is again, this time with two children, in a different setting – palm trees, and afterward on the seashore. There are many more photos: Lydia with one of her daughters against the backdrop of a Christmas tree, with something written in Arabic in the background, he and she by the side of a pool. They change with time – her hair gets longer, his fills with gray, the faces grow round, the bodies are heavier, the children grow up – but the eyes are still luminous. Since 1997, Lydia, 43, an accountant by profession, and the mother of three children, has lived in the Gaza Strip with her husband, Ihab, a dentist who has his own clinic. 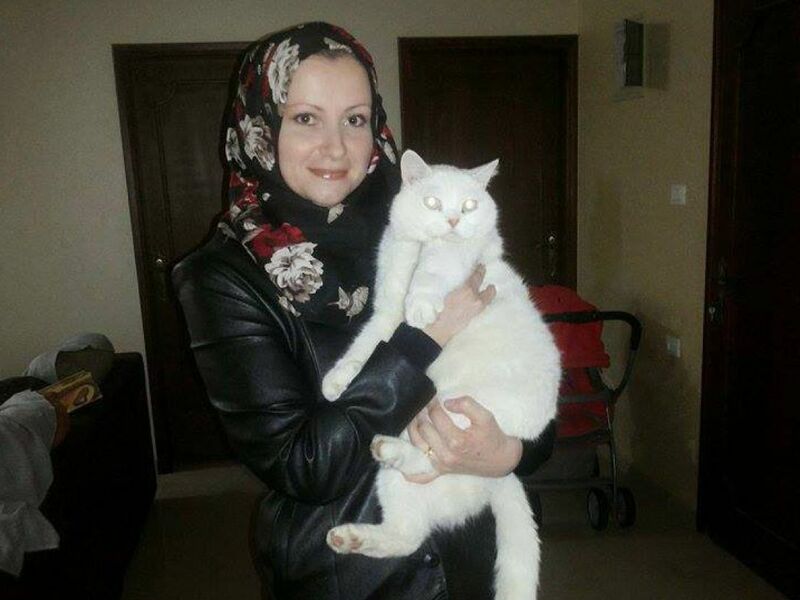 For me, it all started with the story of Sonia, a mixed-breed cat – Angoran-Persian – which was sent to Israel from Gaza for lifesaving medical treatment. The cat’s owner, Tatyana Zaqout, 39, mother of three, who lives in Beit Lahia, says she contacted most of the animal-rights organizations in the world, told her story on the Russian-language Facebook page “Israel Loves Cats,” and managed, exceptionally, a few weeks ago, to get Sonia through the Erez checkpoint and into the hands of an Israeli organization called Let the Animals Live. The cat’s condition has improved somewhat since, but the treatment is continuing and she is staying in Israel for the time being. Tatyana is in regular touch with the clinic. Tatyana, who is originally from Poltava, a city in central Ukraine, southeast of the capital, Kiev, is one of several hundred women who have moved to the Gaza Strip in recent decades from countries of the former Soviet Union – mainly Ukraine and Russia – with their Palestinian husbands. About a decade ago, I heard that some of them occasionally called in to Pervoye Radio, a pirate station that broadcasts in Russian from Rishon Letzion and could be heard, at least in the past, in the Strip. Those conversations, which in the current Israeli-Palestinian reality are comparable to signals from outer space, piqued my curiosity even then. But I didn’t know how to track down the women. The story of Sonia burst an internet dam for me, and I began to find Facebook profiles of Russian-speaking women from Gaza, accompanied by Ramadan greetings, “Happy Victory Day” messages, recipes, quotations from the Koran in Russian and Arabic, pictures of children and also mourning posts for relatives who perished in the 2014 war in the Strip. Almost half the women I contacted via Facebook agreed to talk to me, and in the end I spoke to five of them. The very possibility of speaking with these women, who live in a “hostile entity” an hour’s drive from Tel Aviv, was immensely gratifying, and I thanked fate for the common language and culture that opened this conflict-bypass channel for us. Still, despite the closeness that developed, I felt that there was much that was not being said explicitly and that remained between the lines – and I don’t mean only the criticism some of them have of Hamas, which they were only willing to express off the record. Tatyana came to Gaza in 2005 with her husband, Ayman, after he completed his dentistry studies in Poltava. 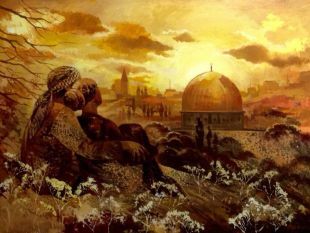 Many Palestinians, from both Israel and the territories, attended institutions of higher education in the Soviet Union, together with thousands of other students from countries that were in the communist giant’s sphere of influence. That tradition continued after the collapse of the Soviet empire, in 1991, with many Palestinian men still coming to Russian and Ukrainian cities to attend medical schools and other institutions. For Elena Hamida, who also arrived in Gaza in 2005 from Poltava when she was not yet 25, the first years in her new home were filled with suffering. She met her future husband when he was a medical student and she was studying nursing. The couple married and had a son, and her husband’s father wanted to see his grandchild. Ignoring the importuning of friends and relatives, Elena agreed to let her husband take their 2-year-old son to the Gaza Strip. She was then pregnant with a daughter and stayed behind to continue her studies and have the baby, she tells me by phone. She hoped her husband would return soon in order to continue his studies. But a year later he called to ask her to come to Gaza. And in Gaza that can’t happen? When I mention to her that the war in Ukraine is distant from Poltava, Elena adds that economically, too, she would not be able to manage there with three children. Some time after our conversation, Elena got in touch to say that she wanted to clear up a few things. She tells me her story more directly, noting her early naivete and her desire to curry favor with her husband Hazam’s family. She adds that the Russian and Ukrainian legations evacuated her and her children, along with many other women at the beginning of 2009, during Israel’s Operation Cast Lead. At that time she lived for a few months in her hometown, and didn’t want to return to Gaza. But after much soul-searching and under pressure from the children, she decided to go back after all, but now, she says, as a different woman – tougher, blunter, able to stand up for her rights. Elena later writes to say that eventually, too, the confrontations with her new relatives abated. In our phone call, Elena told me about the power outages and about how, during Operation Protective Edge, in the summer of 2014, she made fires on the roof in order to cook noodles or rice, and was afraid that the drones hovering above would mistake what she was doing, and think that she was about to fire a rocket. In a message she sends me she underscores other aspects of life in the Strip: “Our Gaza is beautiful. We have parks, pools, community centers with activities for children. Of course, they’re not perfect, like those in Russia and Ukraine, but even so... 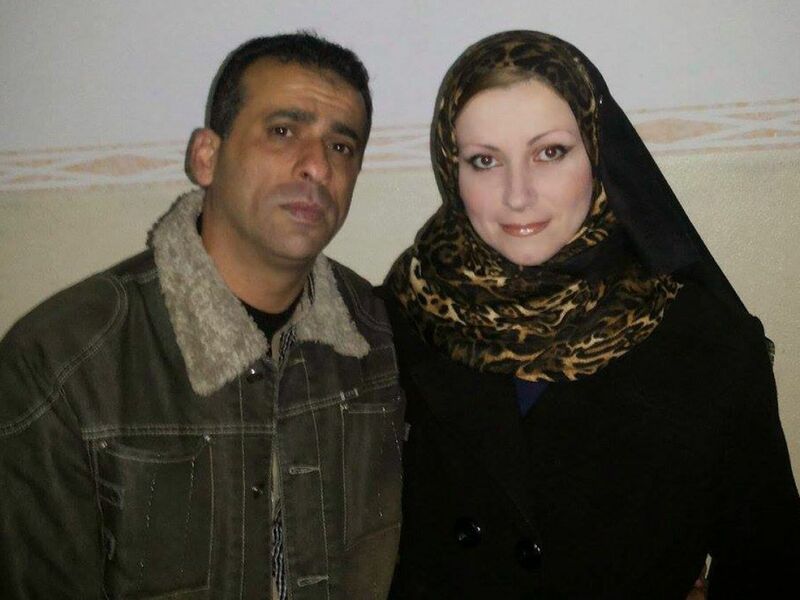 If we hadn’t been bombed and there wasn’t a war... Other than that, everything is fine, the children are healthy, smart, my husband is excellent, what more can I ask for? I don’t need more. With a family like this I can get along anywhere in the world,” she sums up. 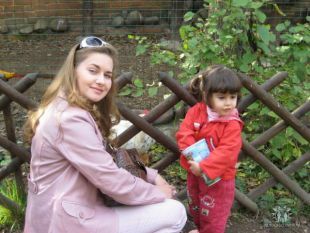 The family support structure, the possibility of buying on credit in the grocery store and a traditional society that observes the laws of Islam strictly are sources of security for these women, who left their home countries at different stages of the cruel processes that took place after the fall of the Soviet empire. Indeed, for a time in the 1990s the standard of living in Gaza was higher than in remote Russian cities. For example, Lydia Salah, who met her husband in Volgograd and moved with him to the Strip in 1997, relates that it was economics that prompted their decision to leave Russia, even though her husband received Russian citizenship and they would have liked very much to stay there. Furthermore, even though a large proportion of Palestinian physicians had had their medical education in the former Soviet Union, the quality of medical care was and remains far higher in Gaza than it is in Russia, according to Tanya Kalub, a dentist of 45 who is married to a Palestinian heart surgeon. She says this not only as a physician but also as a mother and as a patient. 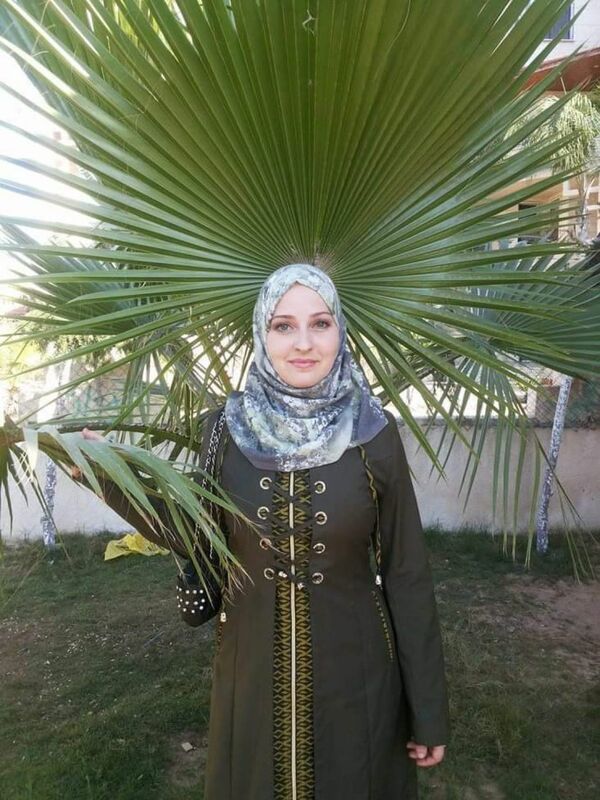 Tanya became ill with cancer and completed her chemotherapy in Gaza a year ago. 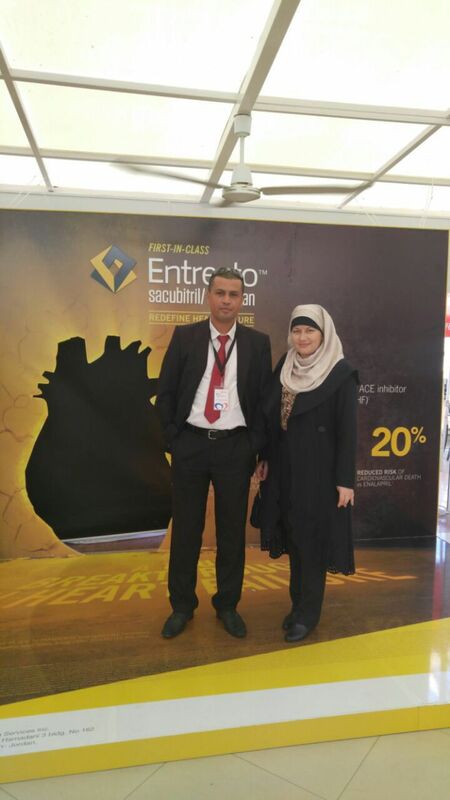 Tanya and her husband, Mohammed, lived for many years in the city of Krasnodar, in southern Russia, where they both worked in a hospital and ran their own pharmaceutical-marketing business. Their two older daughters were born there. They came to Gaza in 2011, and their youngest daughter was born there three years later, during the 2014 war. Toward the end of Tanya’s last pregnancy, her husband’s younger sister was killed when an Israeli shell struck her house. In contrast to 2009, when Russia and Ukraine flew their citizens out of the Gaza Strip, in the summer of 2014, their assistance took the form of transporting families that wished to be evacuated to the Rafah crossing, where they were on their own. The majority of the women chose to remain in Gaza. Most of the families were directly affected by the war; two of the women I spoke with lost relatives. “We have no connection with any political group,” Tanya says. “Everyone is a doctor or a teacher, no one is a party member. The attacks usually came at night, but this one was in the morning, at nine o’clock. 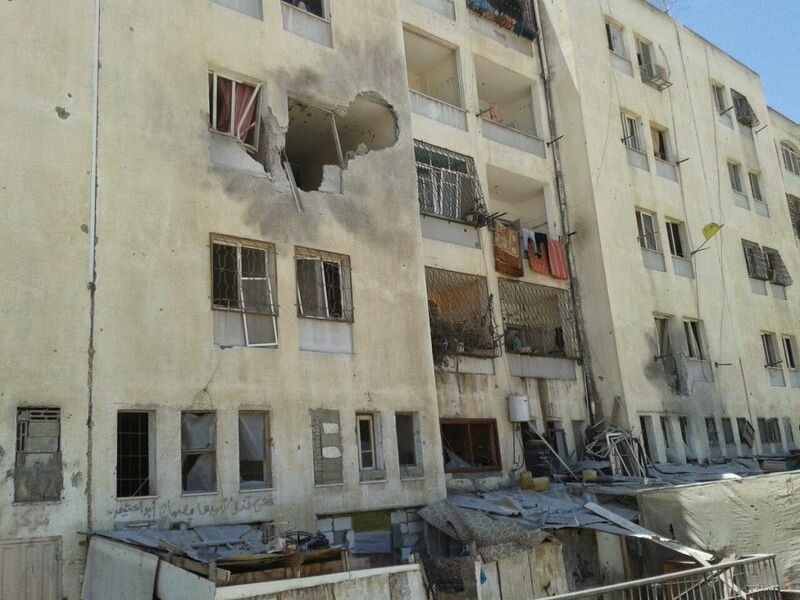 It was the second day of Id al-Fitr [the holiday that concludes Ramadan].” Her husband’s sister’s family lived on the fourth floor of the neighboring building. A shell hurtled into their home. Some of the women make it sound as though the electricity problem is, all in all, something that can be overcome – that it’s just a matter of habit and skill. It’s impossible to keep perishable food in the house, and air conditioning is out of the question, but what troubles the women far more are the closed borders and the impossibility of visiting their relatives overseas. The option of leaving via Israel is almost nonexistent, and to get a permit to travel through Egypt can take months if not years. The women’s Russian citizenship doesn’t always help. 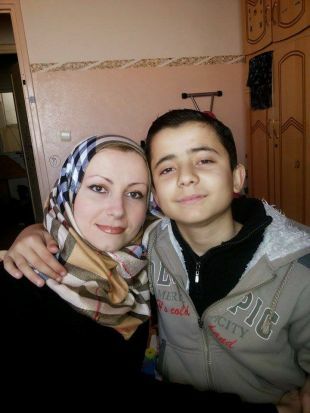 The situation is even more difficult for Irina Rumiantseva (who asked that her Arabic married name not be used), a painter of 52 and the mother of four children. She’s been waiting for an opportunity to exit for several years, without real hope. 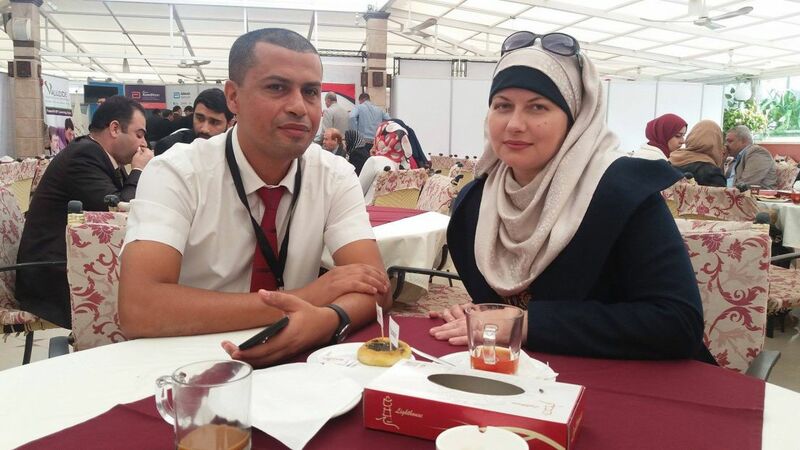 Irina, whose husband was director general of the Ministry of Construction and Architecture on behalf of Fatah, is the only woman I spoke with who speaks forthrightly of her desire to leave the Gaza Strip. She was born in Sevastopol, the major port city on the Crimean Black Sea. In the mid-1980s, she attended the academy of arts in Leningrad. There she met her husband, Maher, who was also a student in the institution, in architecture, and went on to do doctoral studies in the field. Afterward, the city they lived in reverted to its original name, St. Petersburg, and if at first it was only Maher who was a foreign student, Irina also received that status in Russia when the Soviet Union broke up. (Two-and-a-half decades later, Russia’s annexation of Crimea again changed Irina’s legal status: From being a Ukrainian citizen she became a Russian citizen, and all without leaving the Strip.) The couple’s first child, a daughter, was born in Leningrad. But in the early 1990s, they had no choice but to move to Gaza. Neither of them could stay in Russia, and Irina’s hometown was off-limits to outsiders for security reasons. And none of that exists? Irina’s father celebrated his 80th birthday this month, back in Sevastopol. She’d promised him to visit immediately after Ramadan, at the end of June, but it didn’t work out. 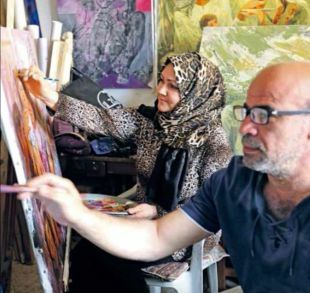 The siege of Gaza is also seriously undermining her and her husband’s careers as artists, a career they launched after he was fired from the ministry. A painting by Irina Rumiantseva. Courtesy of Rumiantseva. After Maher was fired – in the wake of a brief civil war between Fatah and Hamas, which resulted in the latter assuming exclusive control within Gaza – the couple changed course and began to make a living from selling their artworks, which Irina describes as “traditional Palestinian art.” There is no demand at all in Gaza, but according to Irina there are quite a few affluent Palestinians abroad who are happy to purchase paintings of pastoral Palestinian landscapes and images of Al-Aqsa Mosque. Like many Fatah officials who remained loyal to the party and did not join Hamas, Maher continued to receive a salary from Ramallah even after he stopped working in the ministry. Recently, his salary was cut from $1,500 to $1,000 a month, and the income from painting became the couple’s primary source of income, with which they pay for the studies of their middle son and his sister, in Berlin. Their firstborn daughter emigrated not long ago and now lives alone with her 3-year-old daughter and an infant in Brussels. 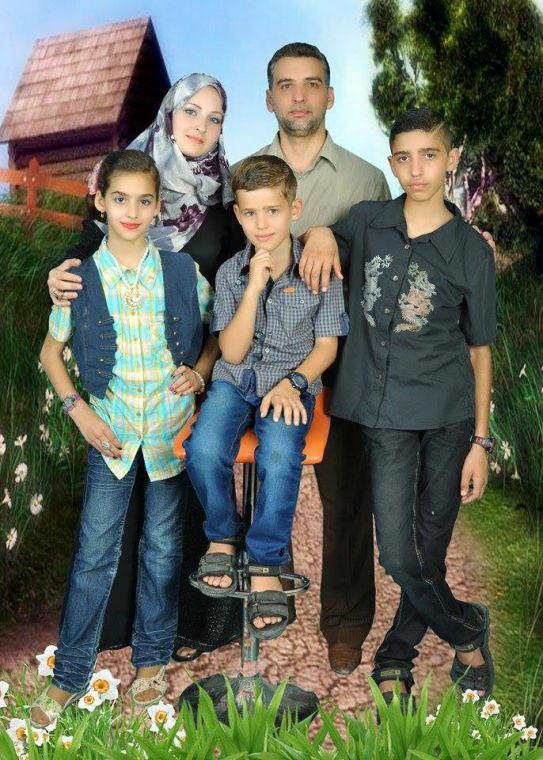 Irina says that their youngest child, a daughter of 13, also wants to leave Gaza. The problem is that there’s no way out. Unlike Irina, most of the women I spoke to say that they have become used to Gaza to a degree that would make it difficult for them to reintegrate into the life of their former homeland. Still, Lydia Salah says that if things don’t get better, she will not object if her children want to leave. “Nevertheless, I hope everything will work out – because all people want to live in peace,” she writes me on Messenger, and adds, “When I speak with my sister, I laugh all the time: ‘Wait for me until I retire, we’ll sit as grandmothers on the bench and remember our youth.’” Finally, she says that if it were up to her husband, they would have left long ago: She is the one who’s keeping him in Gaza.